Colonel Edward L. Thomas, commander; Lieutenant Colonel Gustavus A. Bull; Major Bolling H. Holt; First Lieutenant James H. Ware, adjutant; Captain Lovick P. Thomas, quartermaster; Captain Virgil L. Hopson, commissary officer; Doctor James P. Hambleton, surgeon; Doctor Peter E.L. Jennings, assistant surgeon; Reverend George W. Yarbrough, chaplain. *Company A – Haralson Brown Guards from Haralson County. Enlisted August 15, 1861. Commanded by Captain William J. Head with 76 men. *Company B – Bartow Avengers from Newton County. Enlisted on September 21, 1861. Commanded by Captain James M. White with 79 men. *Company C – Campbell Rangers from Campbell County. Enlisted September 17, 1861. Commanded by Captain David B. Henry with 77 men. *Company D – From Heard and Troup Counties. Enlisted September 23, 1861. Commanded by Captain Lee A.J. Williams with 71 men. *Company E – Campbell Volunteers from Campbell County. Enlisted August 12, 1861. Commanded by Captain Evan R. Whitley with 78 men. *Company F – From Gwinnett County. Enlisted September 23, 1861. Commanded by Captain Robert M. Rawlins with 68 men. *Company G – Walton Sharpshooters from Walton County. Enlisted September 16, 1861. Commanded by Captain William S. Barrett with 64 men. *Company H – County Line Invincibles from Gwinnett and Hall Counties. Enlisted September 24, 1861. Commanded by Captain Aaron K. Richardson with 75 men. *Company I – Chattooga Mountaineers from Chattooga County. Enlisted September 25, 1861. Commanded by Captain William L. Groves with 67 men. *Company K – Harris Guards from Harris County. Enlisted July 4, 1861. Commanded by Captain William H. McCullohs with 77 men. 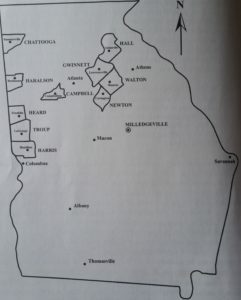 Also note that Campbell County is now where S. Fulton is on the south side of Atlanta.